Genomics, Medicine, and Pseudoscience: Stabbing kids with needles: malpractice, or just a very bad idea? Parents: don't let an acupuncturist stick needles into your kids. Can we exant it to: Parenst, be very careful with anybody wanting to stick needles into your kids, especially vaccines who are known to contain heavy toxins and may cause various problems? Wow. I'm very impressed by the complete lack of intelligence you have regarding Chinese Medicine. "Most infections are caused by bacteria already present on the skin, which enter through the puncture wound." Yes, why else would acupuncturists clean the point of puncture with alcohol first? At the same time, how come countless diabetics are never told by their family MD that they should also clean their skin before jabbing their finger every single day with a (much bigger) needle to test their blood sugar? The main thing, really, is that there are about 12 deaths a year from acupuncture WORLDWIDE, vaguely attributed to acupuncture itself, vs about 195,000 deaths IN-HOSPITAL from medical errors per year IN THE US, and close to 1 MILLION preventable deaths from medical errors a year. Are we telling people that medicine is dangerous? 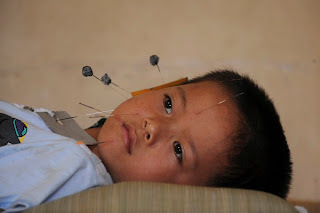 Yes, the research on acupuncture is severely lacking. But any half-decent scientist knows that a handful of poor studies is not the end of the story. It's one thing to prove that this pill of xyz 500mg provides this much more reduction in blood pressure than a sugar pill. But it's much harder to provide a control for something like acupuncture than it is for something like a pill or a cream. Not to mention that the money to orchestrate the large studies just isn't there, because acupuncturists tend to be driven by a desire to help, not a desire for big corporate profits. Anon: your arguments are, essentially, non sequiturs. Sure, there are medical errors that cause injury and death. Those are bad and we should eliminate them. But medicine provides a real benefit, much of the time. Acupuncture does not - and thus any risk is unacceptable. Also, your claim of "12 deaths a year" has no evidence to back it up, nor can we find such evidence, because acupuncture is almost entirely unregulated and un-monitored. But the whole, tired argument that "medicine causes harm, therefore try X" where X is quackery, is simply bad logic. Once the death rate from doctors and hospitals falls from 700,000 to say 600,000 a year then we should talk about using western trained doctors and hospitals again, otherwise anyone else is less of a risk.